Andrew's live blog is the main event today, but here's a halftime distraction for you. It's the first half drives, in a (hopefully) visually appealing way. Game starts at the top and time runs out as you move down. 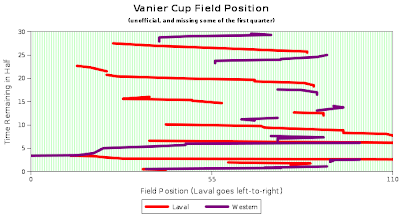 Laval's left-to-right in red; Western's right-to-left in purple. I didn't get the hang of it until the second quarter, but hopefully it makes sense. 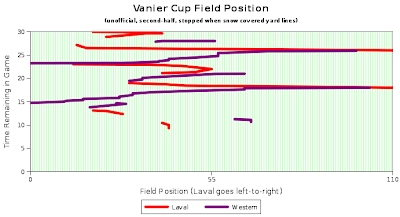 Note Laval's three big drives in the second and how, for most of the half, Western was pinned in their own end. UPDATE: Here's most of the second half. Had to stop with about 8 minutes left because it was impossible to see the hash marks through the snow. Also, the game was pretty much over by then anyway (41-21). You can see the short drives in the fourth, possibly caused by the conditions. Very interesting, Rob; shows how much of the ball Laval's had. If Western didn't get those stops early, this could really be a blowout by now.